San Diego-based superfood and smoothie chain Everbowl has secured $3 million in funding from a Toronto-based private-equity group, the company said Tuesday. The 17-unit Everbowl said the company plans to use the investment from International Franchise Inc., or IFI, a subsidiary of Serruya Private Equity, or SPE, to accelerate growth. By the end of 2019, the company said it plans to open as many as 45 locations. 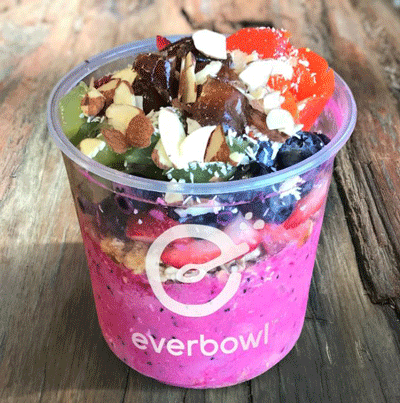 Everbowl launched two years ago as a counter-service shop serving a menu of bowls and smoothies made with superfood bases such as acai, pitaya, graviola and acerola. Sixteen-ounce smoothies and 24-ounce bowls cost $8 to $9. The fast-casual chain has expanded to 17 locations in Southern California ranging from San Diego to Riverside. “We’re proud to be a part of a brand that continuously serves high quality, thoughtfully crafted, great tasting treats and snacks that are not only delicious and refreshing, but also good for you,” said Aaron Serruya, CEO of IFI, in a statement. Serruya’s other investments include Pinkberry, Yogen Früz and Cold Stone Creamery. In late 2018, Serruya and London-based Lion Capital LLP bought Global Franchise Group, whose brands include Great American Cookies, Hot Dog on a Stick, Marble Slab Creamery/MaggieMoo’s, Pretzelmaker and Round Table Pizza. Aaron Serruya and his brother,Michael Serruya, founded the Yogen Früz frozen-yogurt chain in Canada in the mid-1980s. They acquired a controlling interest in Scottsdale, Ariz.-based Kahala Brands Ltd. in 2013, bringing such brands as Cold Stone Creamery and Blimpie under the Serruya umbrella.